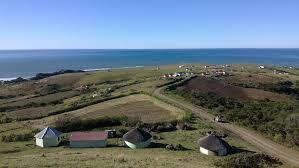 Originally the Transkei included the territories of Idutywa Reserve, Fingoland (Mfenguland) and Galekaland (Gcalekaland). Following their annexation they were restructured into the divisions of Butterworth, Tsomo and Nqamakwe for Fingoland; Kentani and Willowvale for Galekaland; and Idutywa for the Idutywa Reserve. Transkei, former republic (though never internationally recognized as such) and Bantustan in Southern Africa. It lay along the Indian Ocean and was surrounded mainly by the Republic of South Africa, though to the north it also touched Lesotho. Transkei consisted of three separate land units, two much smaller than the third. The capital was at Umtata. Transkei was administratively created by the South African government in 1959 as a non-independent Bantustan designated (together with Ciskei) for the Xhosa-speaking peoples. Transkei was made nominally independent in 1976 in order to serve as a legal homeland for millions of Xhosa-speaking blacks who had lost their South African citizenship under the apartheid system of racial separation. By the early 2nd millennium ce, the area to the east of the Great Kei River was occupied by the ancestors of the present-day Cape Nguni. These peoples are primarily speakers of Xhosa and closely related dialects—Thembu (Tembu), Mpondo (Pondo), and Mpondomse (Mpondomise). After 1820 they were joined by the Mfengu (“Homeless Wanderers”), people of various chiefdoms from what is now the South African province of KwaZulu-Natal, who were fleeing before the Zulu chief Shaka. As Europeans (Boers) moved into the territory from the west, they clashed with the resident Africans, and in 1778 the Great Fish River was fixed as a boundary between the Xhosa (the southernmost Cape Nguni) and the Cape Colony; but the Xhosa did not understand that the treaty was intended to limit their westward expansion. The Europeans attached the name “Ciskei” to the Xhosa lands between the Great Fish and Great Kei rivers; those lands lying east of the Great Kei they called “Transkei.” A series of Cape Frontier Wars ensued between 1779 and 1879. In 1847 the British annexed Kaffraria, an area directly west of the Great Kei that was attached to the Cape Colony in 1866. Between 1879 and 1894 the other Transkeian geographic regions—Griqualand East, Pondoland, and Tembuland—were incorporated within the Cape Colony. In 1894 territorial councils were established, replacing the Cape Nguni’s traditional political system, and by the beginning of the 20th century, these were grouped under a single General Council for the Transkeian Territories. In 1910, when the Union of South Africa was formed, these territories were incorporated into it as part of the Cape of Good Hope province. Under the Promotion of Bantu Self-Government Act of 1959, Transkei became the first of the Bantu Homelands, or Bantustans, and in 1963 a Legislative Assembly was introduced, all of whose actions, however, had to be approved by South Africa. Upon the creation of a (nominally) independent Transkei in 1976, all black Africans with language ties to Transkei (whether or not they lived there) lost their South African citizenship and became citizens of the new country. TheOrganization of African Unity urged the world to shun Transkei on the grounds that recognition would constitute acceptance of apartheid, and the United Nations supported its view. Under the South African constitution that abolished the apartheid system, Transkei was reincorporated into South Africa in 1994 as part of the newly created Eastern Cape and KwaZulu-Natal provinces.